west pediment of the Temple of Aphaia in Aigina (490-480 BCE). Classicist Sarah Bond, professor at Iowa and regular contributor to Forbes, has received a lot of attention lately because of a piece regarding polychromic statues in antiquity. To very briefly summarize her essay, Why We Need to Start Seeing the Classical World in Color, while everyone is familiar with bright white Greek and Roman marble statues, most don’t know that these statues were originally very colorfully painted. This is beyond question, especially now that we have incredible equipment that is able to scan for minute traces of pigment. However, this technology is new and the influential 18th c. art historian Johann Winckelmann did not know this. In his overview of western art, he included the whiteness of the statues as an essential component to their beauty. 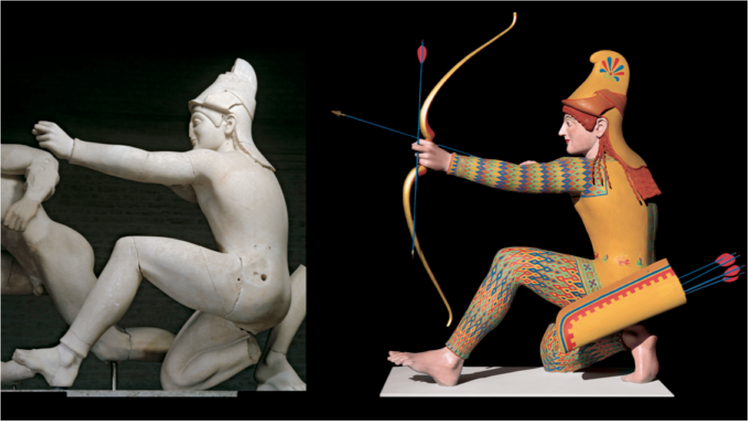 This misconception of Greek aesthetics has influenced art history and aesthetics ever since. It has even contributed to “the false construction of race.” Moreover, some overtly racist organizations have adopted the imagery of white marble statues, drawing on this history of interpretation. I thought this was a good and well researched blog post. It was even better when she was published in a fuller and more researched form in hyperallergic. Having read and enjoyed it, I honestly didn't think too much more about it. Then this happened. Trolls on Twitter, followed by support from other academics on Twitter. Finally, Dr. Bond announced that she had been receiving death threats from people who are part of the so-called Alt-right. At least in some of the Twitter responses it seems clear that there is either zero engagement with the article or we are simply dealing with different ways of understanding. Many of the responses are not directed toward the article at all, but just the assertion that Dr. Bond is clearly another example of a ‘liberal snowflake,’ crazy academic. While I really can understand how non-academics can be frustrated by how we write articles that anguish over minute details or apply critical theories that seem insane, this article is a good, accessible, straightforward look at how polychromic statues lost their paint and lead to particular 18th century views on aesthetics. The vitriol that it has elicited is out of proportion and can only be connected to the assertion that this provides more evidence that race is not a static reality, but rather a social construction. At the same time he is labeling academic elites as a domestic threat (Is there a distinction? Are there non-elite academics who are not a threat?) his organization is continually working to end laws prohibiting weapons on campus, so-called campus-carry restrictions (The NRA on campus-carry; related Rolling Stone article ). While these may at first seem to be separate issues, I think that statements like LaPierre’s are very dangerous and directly contribute to the situations such as the one Dr. Bond has found herself in over the last week. I can only imagine the stress and fear that one who has received death threats for academic views would feel if they also worked in a classroom in which any one of her students can be carrying a handgun. On her blog, Bond notes that one thing she has learned from this is that we need to incorporate the issues race and art into our coursework. I could't agree more. I think also that academics need to become/remain politically active, arguing against the NRA's narrative and asserting that rather than a threat, we are a necessary part of our society's attempt to understand itself and its history.